The father of Malaysian pop princess Datuk Siti Nurhaliza died due to heart failure at the Ampang Puteri Specialist Hospital where he was warded on Friday. 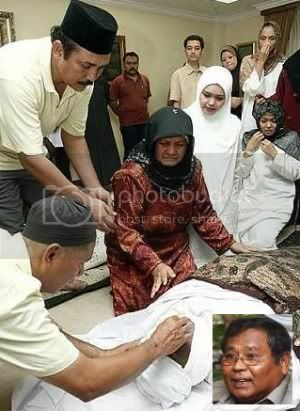 Tarudin Ismail was died around 11.50am Sunday. The 67-year-old left behind widow, Siti Salmah Bachik and seven children. When met at the hospital, Siti Nurhaliza’s husband, Datuk Khalid Mohd Jiwa, said Taruddin Ismail, 67, had heart problems for some time and had been advised to undergo a bypass surgery. “Besides heart problems, he also had diabetes and kidney problems. We rushed him to the hospital after he collapsed in the bathroom on Friday and a bypass was done. “However, he was in a coma since then and confirmed dead at 11.50am today,” he said. Khalid said Siti Nurhaliza and their family members found it hard to accept Taruddin’s death as he was healthy and had planned to go for Haj this year. “He had some heart complications after undergoing by-pass surgery,” said Rozi Abdul Razak, Siti’s sister in-law. However, all the family members were there when he was taken to the operation theatre, said Rozi. “Siti is devastated as she was very close with her father,” added Rozi. Also present at the hospital was the Yang Dipertua Negeri of Melaka, Tun Mohd Khalil Yaakob. Tarudin’s remains were buried at the Kampung Tempoyang Muslim Cemetery in Kuala Lipis Sunday evening. His remains arrived from Kuala Lumpur at 6.50pm and were buried at 7.10pm after a prayer at the Kampung Tempoyang mosque.